These Claddagh earrings are crafted in 14K white gold and feature diamonds studded in the hearts along with the cuffs and the top of the ring with a total diamond weight of 0.080ct. The white gold Claddagh earrings are a stud style with push on butterfly backs and they measure 3/8" diameter. 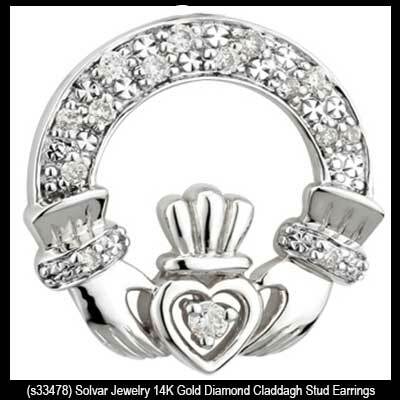 The diamond earrings are made by Solvar Jewelry in Dublin, Ireland and it is gift boxed with a Claddagh history card that is complements of The Irish Gift House. This diamond Claddagh necklace is cast in 14K white gold.